Secondly, you may notice my hasty open letter to Spring above. I'm over the winter and the cold. And just when I thought it couldn't get any more depressing around here, we have a seriously cold and gloomy day on our hands, complete with thunder and lightening and what appears to be a monsoon of sorts. Sad...sad....sad! In conjunction with my letter above, I couldn't help myself from willing some warmer weather in our direction. 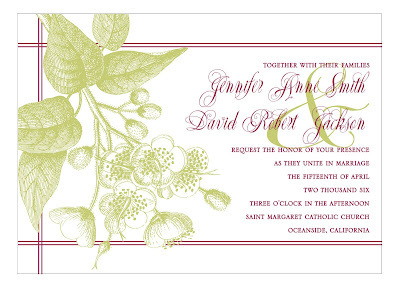 In order to do that, I created a new lovely spring-like invite that is just perfectly suited for an outdoor garden wedding. Fiona, a pre-packaged invitation, will be ready for purchase soon, so be sure to check back in a few weeks! This package will have everything from save the dates to ceremony programs, placecards and table numbers (and maybe a fun coaster or napkin design to add to the mix, too). Until then, take a quick peek and let me know what you think!